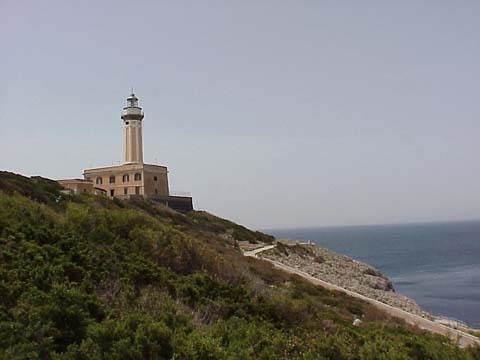 The Punta Carena Lighthouse, named after the westernmost point of the Island, is the second most important and powerful lighthouse in Italy, standing on the rocky promontory named Punta Carena (Carena =keel) because it looks like the keel of a ship. Particularly interesting are: the rocky indented coastline, the Mediterranean vegetation, the pine wood facing a small natural bay, the rocky ridge to the east with its so-called "Grotte dei Caciocavalli" and Torre della Guardia, the vast panorama admirable from the outermost point of the Carena, where the ruins of the fortifications of the Second World War are located, and finally the very Lighthouse, imposing over the surrounding landscape and expressing its major function as a point of reference for navigation. This is a wonderful seaside resort for the sun shines from dawn to sunset (provided the weather is fine, of course), take a chance to enjoy one of these breathtaking sunsets as well as the spectacular night views: the Lighthouse in operation, the illuminated rocks, the starry sky and the moon of Capri, the lamps of Squid fishermen shining through the water and the returning fishermen pushing their typical small boats up the rocks. The Capri Island is situated at the southern end of the Gulf of Naples; just across from Punta Campanella and it is believed to have hosted a lighthouse long before the birth of Jesus Christ. legend, was created by Neptune in his will to move the island more to the south-west. The lighthouse stands on Punta Carena, in the western part of the island, at the end of a car road paved in the 60s to replace the old dirt trail and actually a road to reach Anacapri. Construction works started more than a century ago, in 1862, under the supervision of the borbonic engineers corps, and today it stands as one of the biggest in Italy just behind the Vasto and Genoa lighthouses as to dimensions and range. It was lit in 1867 by the Royal Genio Civile and it was upgraded in 1940. The octagonal masonry tower made of solid Sorrento tufo blocks stands 92 feet (28 meters) on the ground and it is integral to a two-storey service building. It has a symmetrical layout with a rectangular plan a main entrance hall and a staircase to the upper floor. The building has a terraced flat roof. The carrying structure is made of stone and it is still covered with red brick plaster as it used to be in the past according to a recently found French light publication dated 1874. The top of the tower is reachble by climbing up a 132 step spiral staircase; access to the balcony can be gained through an iron door. The walkway is protected by a metal handrail and embellished with a crowning cornice which connects tower to the lantern. A. steel ladder takes to the cylindrical lantern (3 mt in diameter) which rests on a stone base. The light apparatus consists of a 19 lens power projector which can emit a white flash over a period of 3 seconds. The lighthouse is manned and in excellent condition. Located on the southwestern end of the island is Punta Carena. Here there is a place for sunbathing and swimming. At the point is the lighthouse. It appears to be an active aid to navigation and as can be seen in one of the pictures above, it has a fresnel style lens in it. It appears that the living quarters have been converted into multiple private apartments (what a great place to live!). Take a boat onto the island of Capri. From there takea bus into Anacapri. That bus route ends there. Once off the bus continue walking up the road about 50 yards and you'll get to the bus stop for the route to take you to the lighthouse. This route takes you down Via Nuova del Faro. At the end of the route you will be at Punta Carena and the lighthouse.